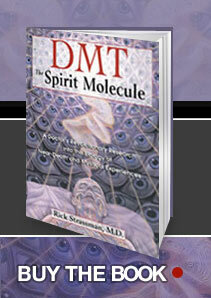 I just finished reading an amazing book: "DMT: The Spirit Molecule". I've been thinking a lot about ayahuasca the past couple of months, having several synchronicities around people contacting me with info, and then a friend lending me a copy of this book. It tells the story of several research studies done on DMT, which is a naturally occurring molecule in most plants and animals, and which figures prominently in the pineal gland, and is a source of psychedelic experiences. The researcher, Rick Strassman, an MD and Psychiatrist, tells a fascinating tale that ties in the dark and the light, alien abduction stories, meetings with bright spirits and insectoid humanoids, time shifting, dimension hopping, plus really cool molecular biological scientific spiritual whatnot. I'd love to try DMT, but of course it's one of those Seriously Illegal Molecules, and I'd be nervous about trying something so powerful when it could be just cooked up in some wahoo's kitchen lab. Any of you guys out there ever tried it? I did acid a few times back in my twenties, and I had some really wild experiences, and a couple of kinda boring ones. Maybe it was the quality. I've never done mushrooms. Someday . . . The book is a great read. If I owned the copy I just finished, I'd pass it on. And I doubt you can check it out of any library, but you just might. It's shifted my perceptions, and I'm grateful for it . . .